With the continuous support and sincere efforts put by our experienced professionals, we have been the best manufacturer and supplier of a qualitative range of Plastic Suit Hanger. In order to suit the various and precise requirements of our esteemed clients, our enterprise is dedicatedly engaged in providing Ladies Suit Hanger in the market. The company is one of the reputed Importers and Suppliers of Suit Hangers in Delhi (India). 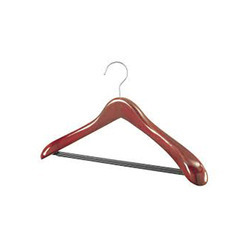 We offer Suit Hangers made of wooden as well as plastic. The Suit Hangers are carefully crafted for better finish and proper support to coats. These Suit Hangers can be made in name of your establishment. Backed by the team of skilled professionals, we are offering a quality assured assortment of Plastic Suit Hanger. The Plastic Suit Hanger is made by using quality plastic and thus, known for their sturdiness. Moreover, offered products are made accordingly as per the requirements of the clients. We have been counted amongst the most trusted names in this domain, engaged in offering a standard quality range of Plastic Suit Hanger. Matching up with the requirements of our clients, we are involved in offering Plastic Suit Hanger. 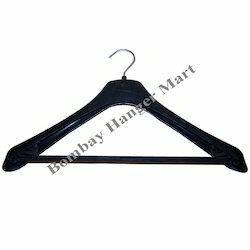 Moulded Plastic suit hangers are made of virgin plastic and are extremly sturdy and durable. We have the privilege to offer our clients a wide array of Plastic Suit Hanger that is available in different designs and patterns. These Plastic Suit Hanger are manufactured using premium grade raw material and are offered at reasonable prices. The hangers that we offer our clients are mainly used for hanging dresses. Hangers used for Blazers, Suits etc. Shoulders Width :- 68 mm.